Ten years from now, we may look back at Game 5 of the 2015 ALDS as a watershed moment for baseball. When Jose Bautista hit that decisive three-run home run and flung his bat into the air, he effectively opened the door for baseball players to be themselves. Unfortunately, not everyone feels that way about the “bat flip”. There are still baseball traditionalists who are banging the drum for “respecting the game” and “playing the game the right way”. In their eyes, Jose Bautista committed the cardinal sin of baseball. In fact, he did nothing wrong. He displayed emotion when – as Harold Reynolds noted – emotions were at the all-time high. What exactly did anyone expect Jose Bautista to do in that moment? And if he wasn’t allowed to who emotion in the biggest moment of his career, when else was he supposed to? 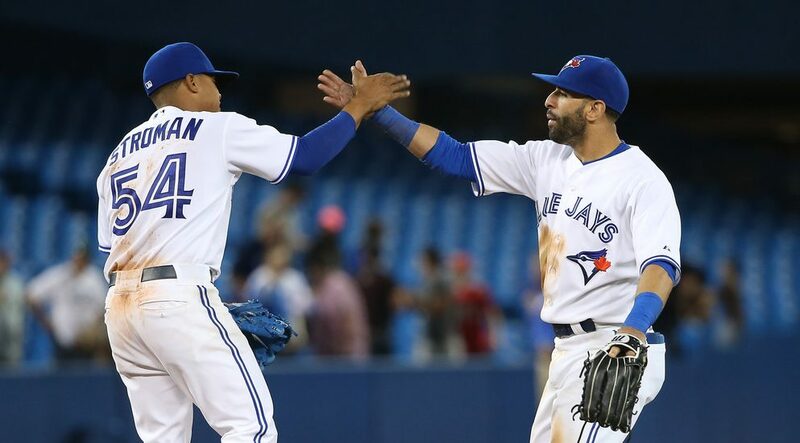 Rougned Odor and Jose Bautista have a history. Last year, Odor was merely waiting for an opportunity to go after Bautista. Apparently, the Texas Rangers didn’t take too kindly to “being shown up” the year prior in the ALDS. That’s when after a hard slide into second (but hardly an egregious one) by Jose Bautista, Rougned Odor shoved him and clocked him in the side of the head. It was one of the dirtiest things I’ve seen on a baseball field in the past ten years. So I was confused when I saw Rougned Odor – the very same player – flipped his bat in the World Baseball Classic, not unlike how Jose Bautista flipped his bat in Game 5 of the ALDS. This was pure hypocrisy from Odor; he’s done this plenty of times the past few years. I suppose Odor’s teammates had no problem whatsoever with him flipping his bat, but took exception with Bautista flipping his. During the 2015 ALDS, Sam Dyson said to Edwin Encarnacion: “Tell him not to do that ever again” after Jose Bautista’s bat flip and go-ahead home run. Matt Bush took it upon himself last May to drill Jose Bautista in the back. A reminder – that was the Rangers’ last opportunity to face Jose Bautista during the 2016 regular season and they chose to use that at bat to plunk him. Odor’s bat flip itself I don’t take issue with. In fact, I’m hoping to see more displays like this in Major League Baseball over the coming years. As alluded to earlier, it displays emotion in a sport where emotion is seemingly outlawed. The Texas Rangers had their fair share of bat flips during the ALDS last year. Elvis Andrus did it. Carlos Gomez did it. At no point was it ever a point of contention back then. The reason why it’s an issue now is because the one person who apparently took the most exception to Jose Bautista’s bat flip – Rougned Odor – someone who felt it necessary to assault a baseball player on the field – committed the very same “cardinal sin” as Bautista. Odor is a hypocrite. The Texas Rangers are hypocrites. Whatever. But if you’re going to pimp a home run like that, at least be assured the ball is going to leave the park. Don’t saunter down the line like a hero and then be left standing at first base like an idiot. The irony of it all? Odor was held to a single on that play. A single! He spent so much time admiring the ball that he failed to get extra bases. At the very least, Odor should’ve picked up a double on that play. Ultimately, it didn’t cost Team Venezuela the victory, but it very well could have. Odor hot-dogged his way around the bases when it wasn’t even warranted, and that was the true injustice from last night’s WBC game. Rougned Odor is a talented second baseman. but he still has a lot to learn and a lot of growing up to do. He has a penchant for flipping his bat, although he acts like he’s above it when someone else flips theirs. Yes! I’m SO glad someone else saw the “shoulda, coulda, woulda” home run & bat flip the way I did! If Odor had simply paid more attention he wouldn’t have looked like a jackass again. Since the “boo boo” was on the world stage (and, presumably, seen by the world) maybe Odor will learn from it and mature. It would be a shame if he doesn’t. I agree 100% with this entire article. Baseball can be infuriating when it comes to stuff like this. Odor’s jackassery aside, can you imagine what hockey would be like if they had the same “cardinal rules” as baseball? It would look ridiculous. These damn dinosaurs about “respecting the game” need to go away and let humans be humans. Hi I don’t think they should throw their bats some one could get hurtpattigibson. I see the bat flip in baseball as equivalent to the stick raise and leap against the glass when a hockey player scores a goal. How many players, including Odor, would have done what Bautista did in that exact moment (hit such a clutch home run)…very few I would guess. And yet he did! And it was obvious to everyone there and everyone watching and to Bautista himself that he had just done something outstanding for his team. Hell yeah! flip your bat! I agree that the bat flips should stay! Bautista’s was very cool and appropriate, as were others since then. Odor’s in the WBC was hilarious since his hit wasn’t a home run & wasn’t even a ground rule double since he never made it to second base. I guess if there’s a rule it should be to make sure it’s a no-doubter! On the subject of Odor, I don’t guess it bothers the Rangers. They gave him a big contract & 2 horses. I would’ve just gave him the horses, saved the money until he matures more. Move em on! Head em up! Head em up! Move em on! Move em on! Head em up! Rawhide!!!!!!!! hahahahahaaaa how many hours until first pitch in Baltimore?! lol! Lmbo! Rawhide theme song! Perfect! 😀 Unfortunately, Odor stuck around >:( 2 HR’s on opening day?! Smh! Hopefully, the Jays game tomorrow in Baltimore will be much better. That was a heartbreaker yesterday. Yeah heartbreaker alright!!! We came close but couldnt take advantage of our many chances sadly. Would love to see a couple of big hits against the Orioles in the first inning…one from Jose would be great! Will probably be another nailbiter one run game again like all the games against Baltimore seem to be 🙂 either way go jays go!!!!!!!! !